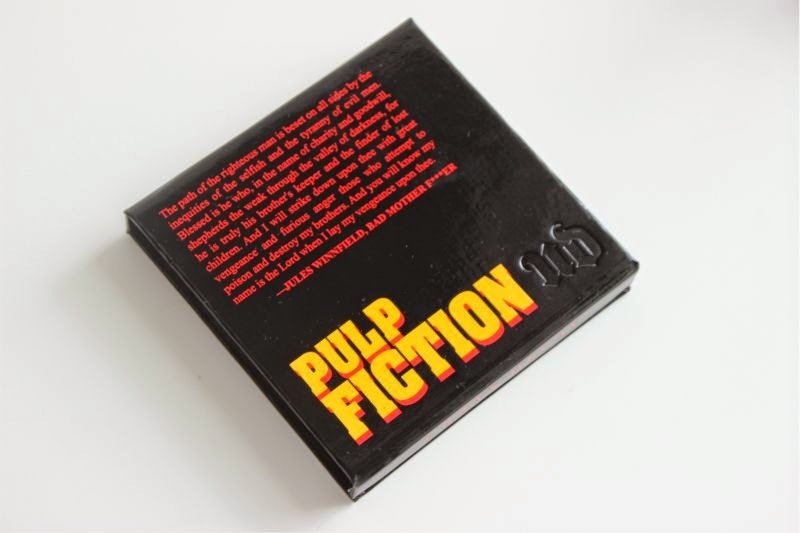 On the 1st of September Urban Decay will launch their Pulp Fiction collection which comprises of five items, bursting full of 90's nostalgia. As far as I can gather it is mark the movie's 20th anniversary, although I do think it is a bizarre collaboration I must confess it has been constructed so well that I can't hold that against Urban Decay. 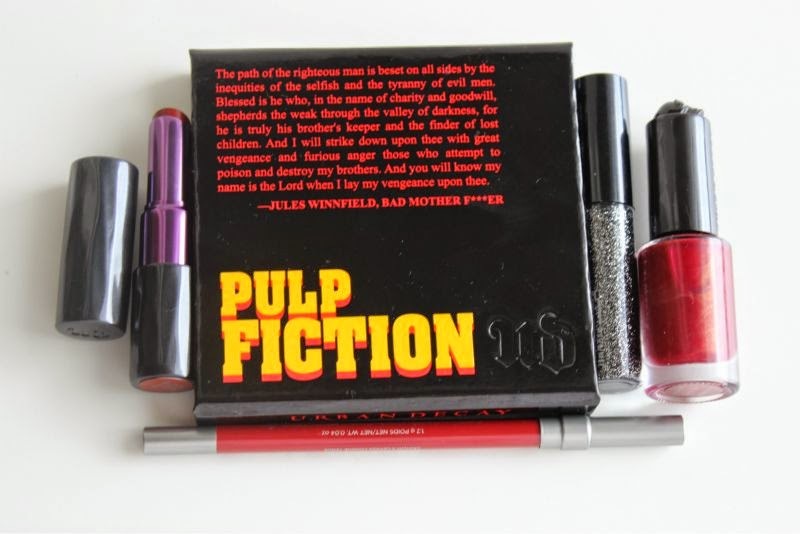 First up we have the Urban Decay Pulp Fiction Eyeshadow Palette which features a cult speech from Samuel L Jackson's character Jules Winnfield. The packaging is made from strengthened cardboard and is every bit as 90's and Pulp Fiction for that matter as you'd imagine. 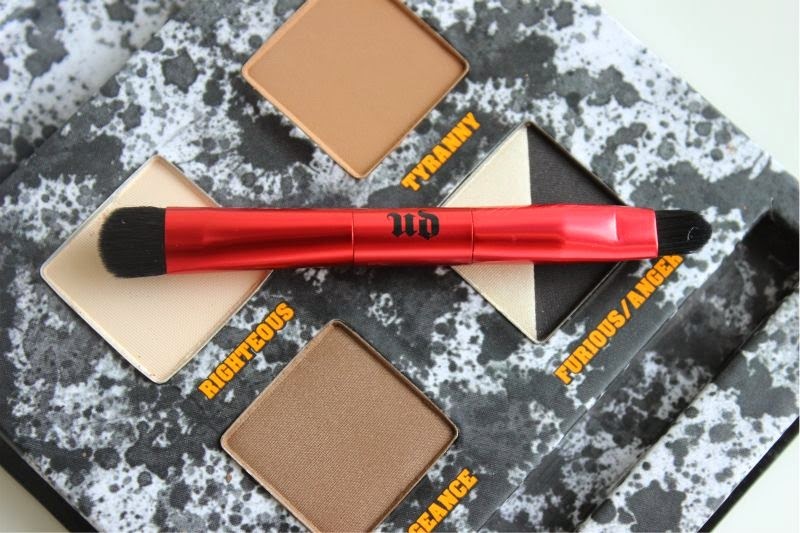 Inside you will find five neutral eyeshadows, a duo ended applicator and a decent sized mirror. 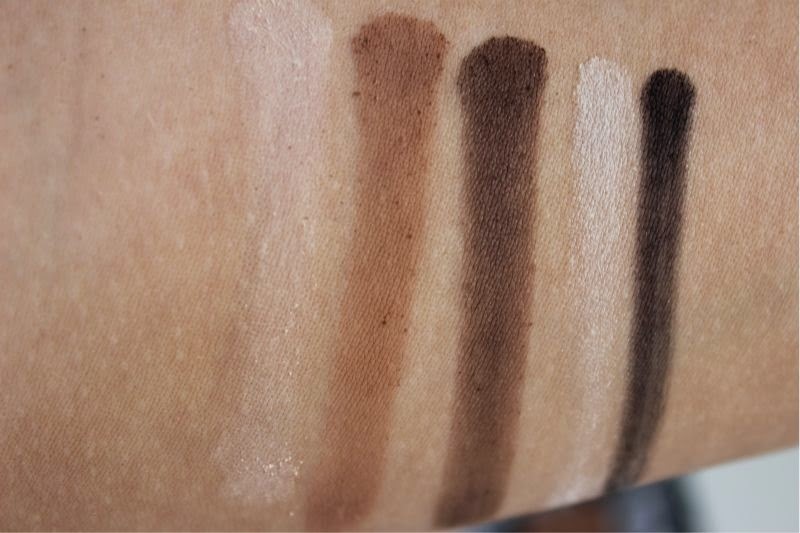 All but one eyeshadow is matte, there is no faulting the pigmentation - four silky soft matte shades that can be used as eyeshadow or of course on the brows. The black shade can be dampened and used as a powder khol. Being matte there is always the worry that the shades could be ashen or chalky but I am happy to report that is not the case. 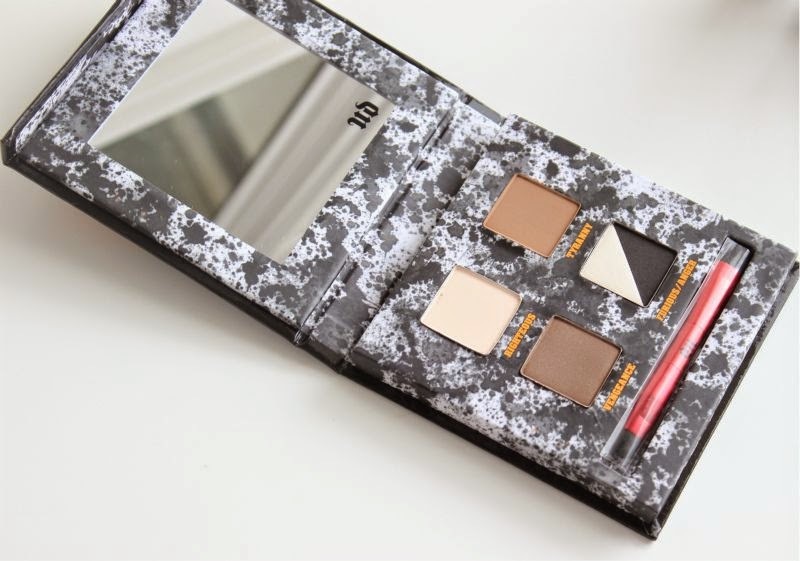 Really Urban Decay eyeshadows are pretty hard to beat. 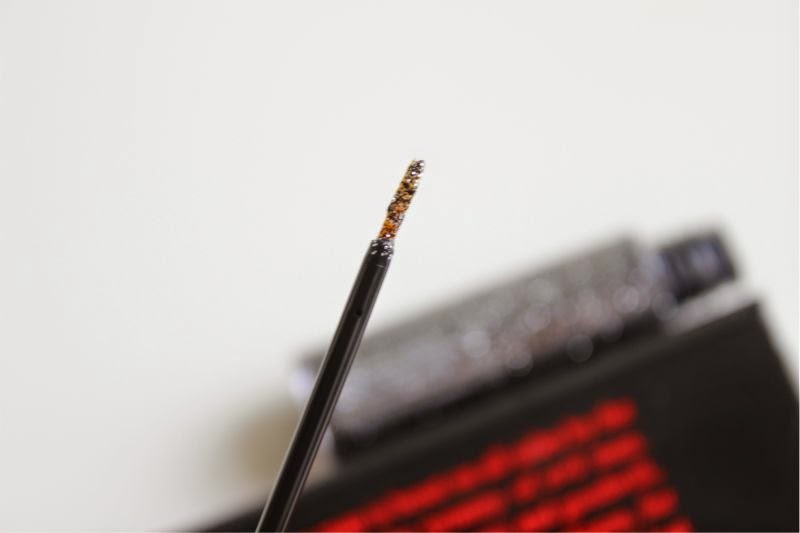 There is one shimmer based highlight shade which is finely milled, a joy to apply - it blends out smoothly and again is well pigmented. For the lips there is two products the Urban Decay Revolution Lipstick and the Urban Decay 24/7 Lip Liner both in the shade Mrs Mia Wallace. This is of course a nod to the shade Uma Thurman wears throughout the movie and the name of said character. 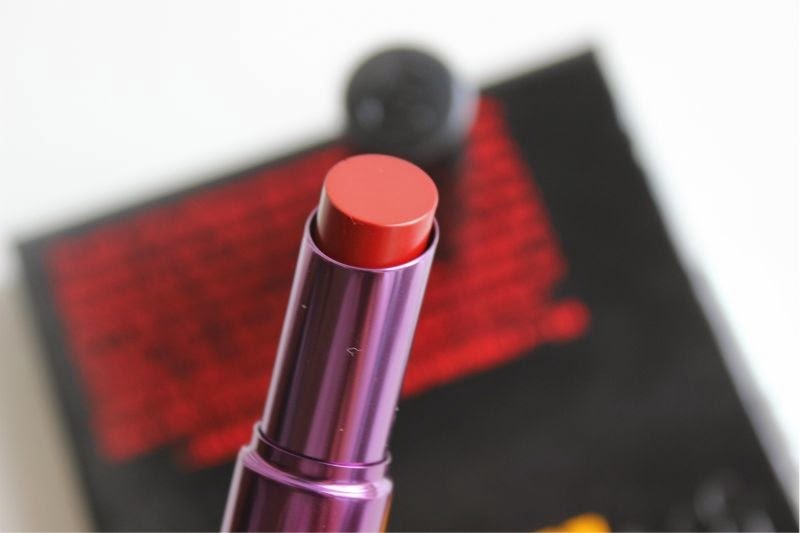 Urban Decay Mrs Mia Wallace is a deep, almost burgundy red that is perfect for the upcoming Autumn/Winter. I find red a difficult shade to wear but do have a soft spot for this neutral and muted yet vampy shade. 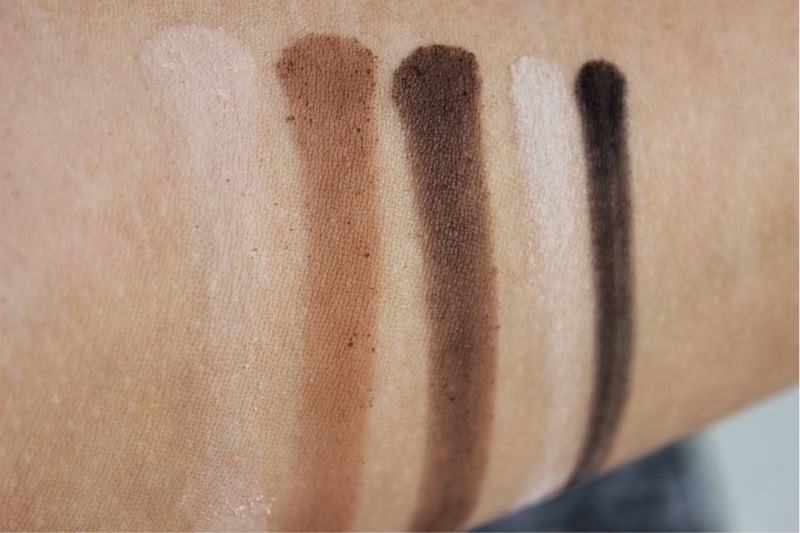 I do feel it will suit most complexions as it doesn't lean cool nor yellow and the soft sheen finish is very flattering. As with all Urban Decay Revolution Lipsticks this glides on with such ease, feels buttery on the lips, is exceptionally pigmented and fairly long wearing. The soft texture is moisturising, not prone to bleeding nor clinging to dry areas of the lips but due to the texture it does transfer when eating drinking. 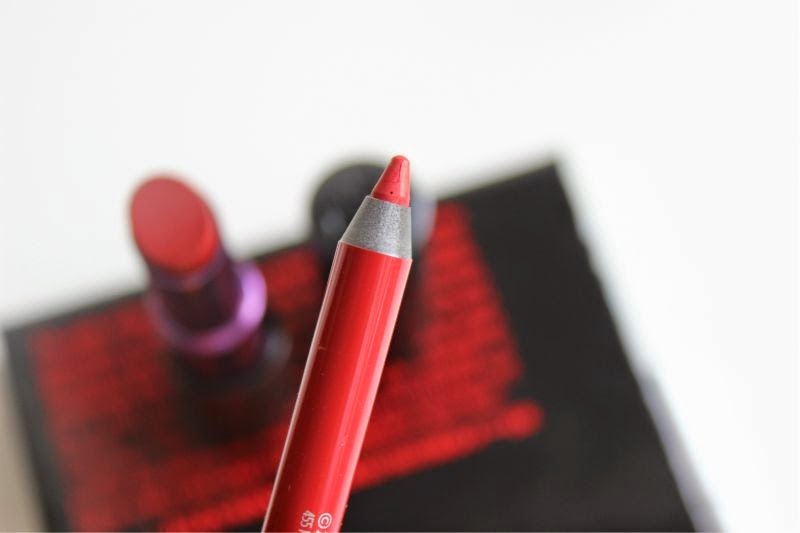 Worry not as Urban Decay have your back Jack in the form of Urban Decay 24/7 Lip Liner in Mrs Mia Wallace which is of course the matching liner to the lipstick. I prefer the liner as it is matte and would most likely be more inclined to use this as an all over lip colour rather than the lipstick. 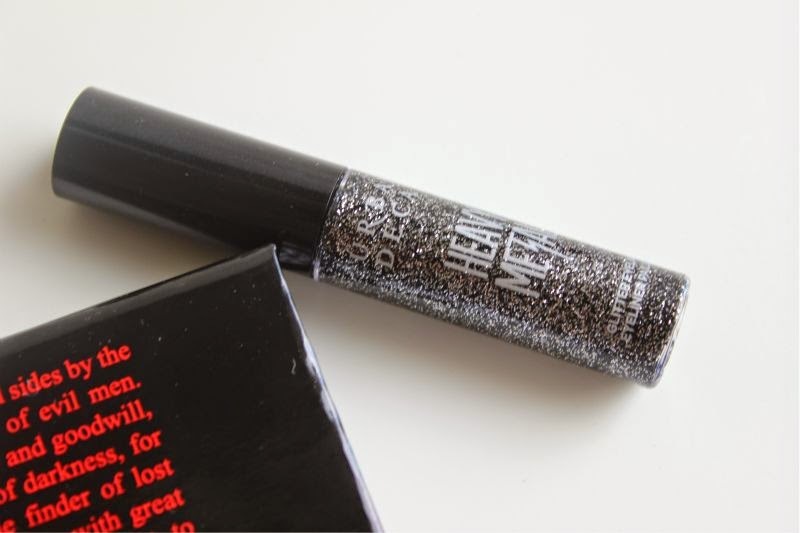 However when used as intended this does help to lock in the shade of the Urban Decay Revolution Lipstick as well as preventing the lipstick colour from fading or smudging throughout the day. You simply can not have a 90's influenced collection and not include a glitter based product of some type. 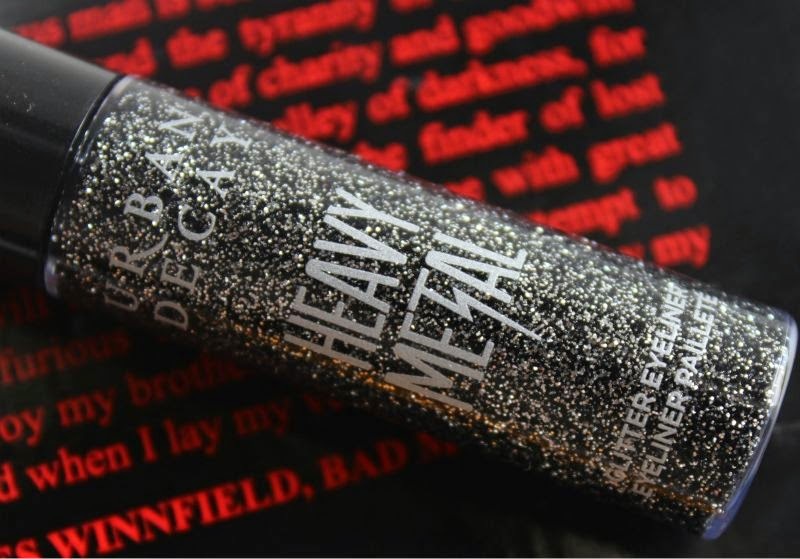 Enter Urban Decay Heavy Metal Eyeliner in Gunmetal - a super glitter based liquid liner that can be used to line the eyes, as an eyeshadow or however you see fit. Gunmetal is a merely of silver and black glitter flecks and as far as glitter eyeliner goes I rather like it. On first application it is a very wet, slightly sticky gel that quickly dries to become a crispy typical glitter gel. In all honesty it is not the most comfortable product to wear but it is all but expected from glitter products! 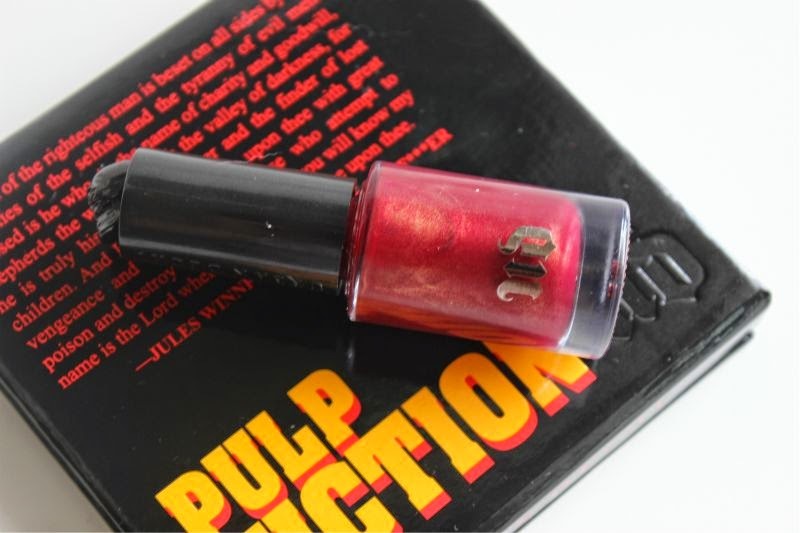 Lastly we have the Urban Decay Pulp Fiction nail colour which is of course entitled Mrs Mia Wallace. 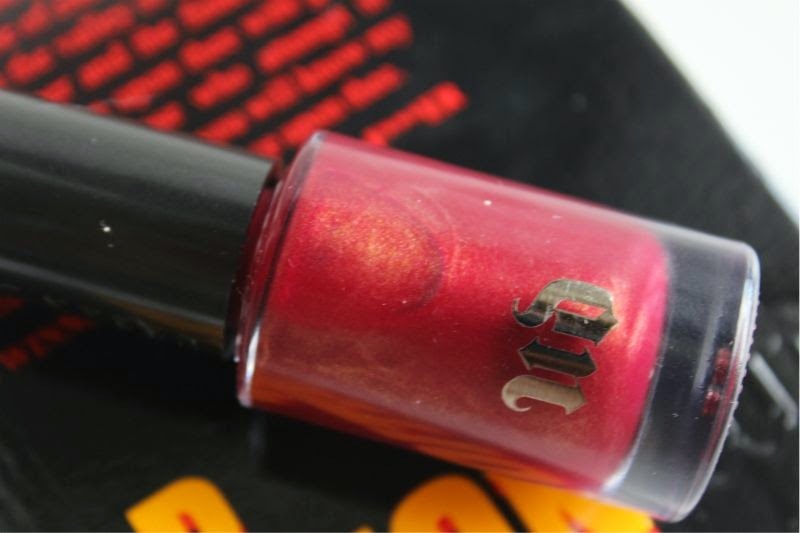 A deep blood red polish that is slightly metallic and has a golden sheen. It is almost identical to the shade seen throughout Pulp Fiction. The original shade was Chanel Vamp Nail Lacquer which you can no longer source within in the UK. Urban Decay Mrs Mia Wallace Nail Colour is my favourite piece from the line up, two quick coats and it is opaque. 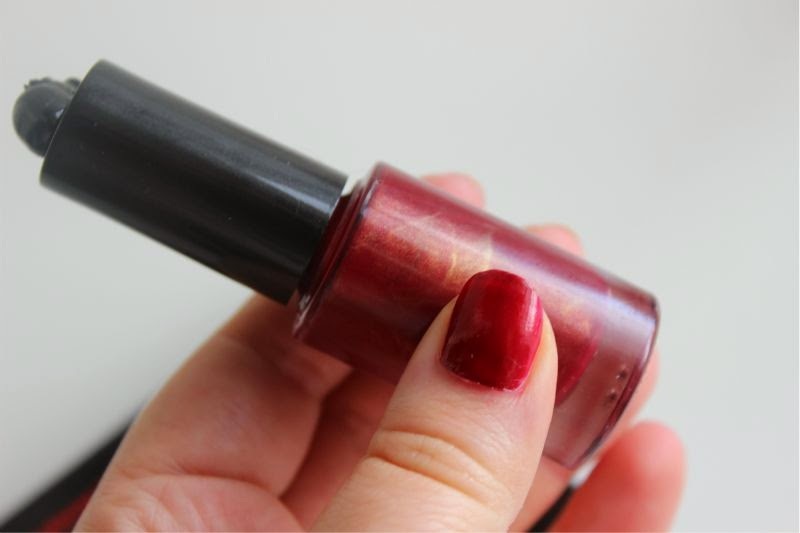 No top coat is needed as it is so glossy and the end result is beautiful deep red metallic nails. If you check out one item from the collection I recommend it be this. 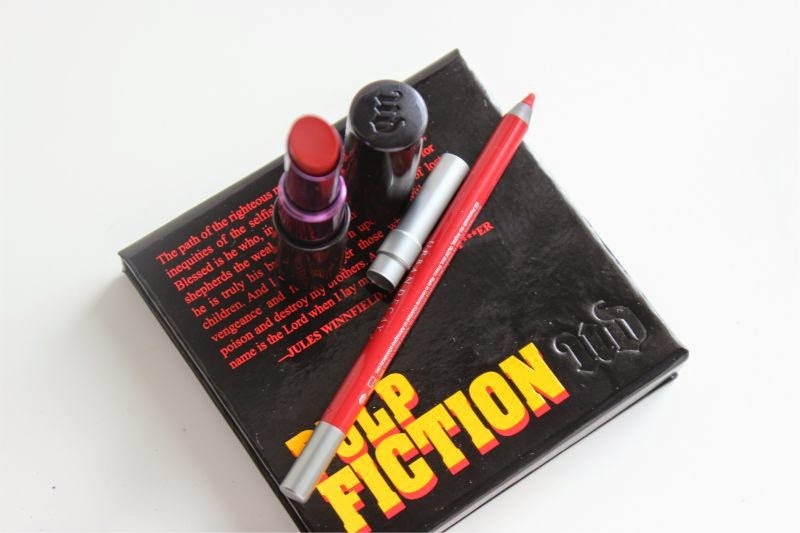 Does the Urban Decay Pulp Fiction Collection appeal to you? The lipstick and the liner will be mine! I must have the lipstick and eyeshadow palette, just gorgeous! The lady at my local Urban Decay told me about this collection a few weeks ago and I was so excited to finally see it launched! 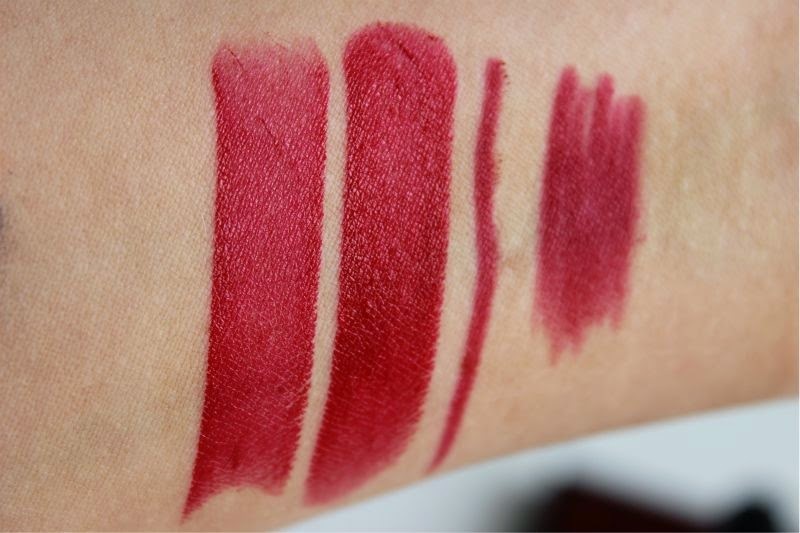 My favourites have to be the lip liner and lipstick, gorgeous bright reds! I have the released date diaried and will definitely be trying to get my hands on the eyeshadow palette. 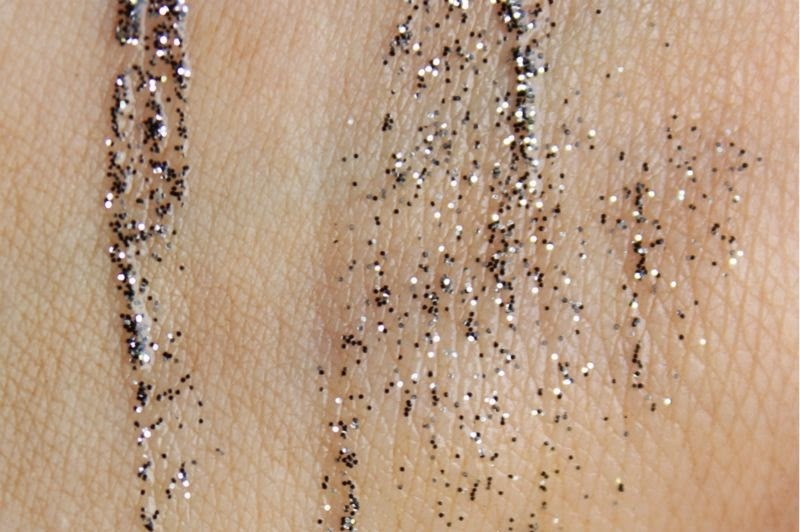 I would use that glitter liner in nail art! Amazing collection. I need it all!! This is a stunning collection, I've been dying to buy something from it! Looks like a lush collection! Love the lip colours! I've never seen this movie, honestly no interest. I also don't find this kit anything special. It'll be a pass for me. But if it had a little mermaid theme to it I'd buy it in a second even if I didn't think it was that special. Love the shade of the lipstick and lipliner, will definitely be picking them up. I've already noted the 1st September in my diary! pulp fiction is my favourite film! will definitely be getting some products! the lipstick, eyeshadow and nail varnish look fab! thanks for the heads up! The shades in the eye palette are stunning and so wearable!! I really love the lipliner and lipstick. Hopefully, they'll still be in stock when I get paid. That lipstick looks just so incredibly nice! 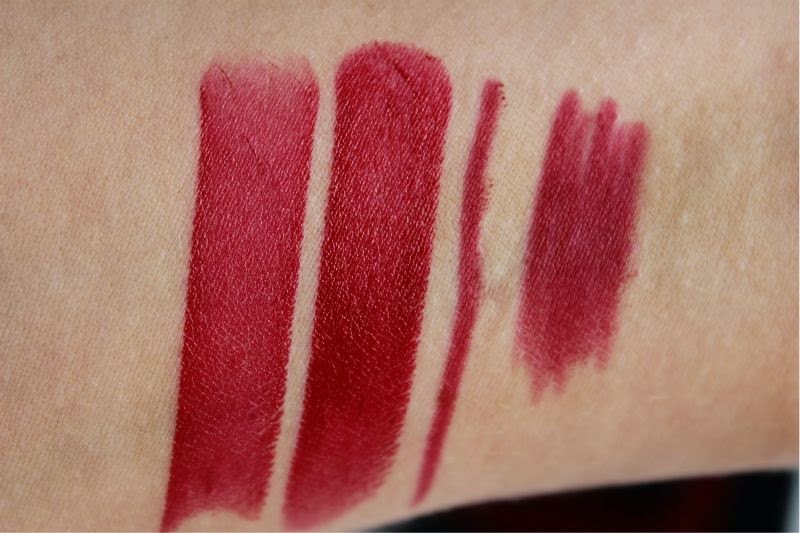 I really need to try out UD lipsticks in general, they look so nice overall! That lipstick! It's so beautiful! That lipstick is sooo beautiful!! Completely in love with this collection! I really like the look of both the palette and the lipstick. I've heard the palette isn't that expensive really either! Argh I want the lipstick and lip liner. I also now want a velvet dress, an inflatable bag, and a choker. I miss the 90s. I miss Moesha. This is so fun! That liner is my fav. I didn't think much of this at first but the swatches just look too good! Loving the palette!